The PNC-funded Words at Play Vocabulary Initiative is into its second year of providing parents with the tools needed to increase their child’s vocabulary. Children from birth to age five and their families braved the cold and snow to gather at the Widener Library on Saturdays in February for stories, activities, and songs focused on STEAM (science, technology, engineering, arts, and math) vocabulary. From making pan flutes to building gumdrop structures, children and adults worked together to put the vocabulary tips to use. After the success of February’s Play Party series, Words at Play is looking forward to spring community events and fun trips for our families. SING! Sing your favorite song on the radio or on your favorite playlist. Can you sing it in a high voice? In a low voice? When you dance to it, do you do a slow dance or a fast dance? CREATE! Make a shape taco: round tortilla, oval beans, half-moon tomatoes, round olives. Talk about the different shapes while you cut vegetables and put the tacos together. COMPARE! Look at pictures of different animals and talk about how they are the same and how they are different. Which animal would you like to be? Why? Look for the Words at Play table at the upcoming Play-a-Palooza at Smith Memorial Playground! 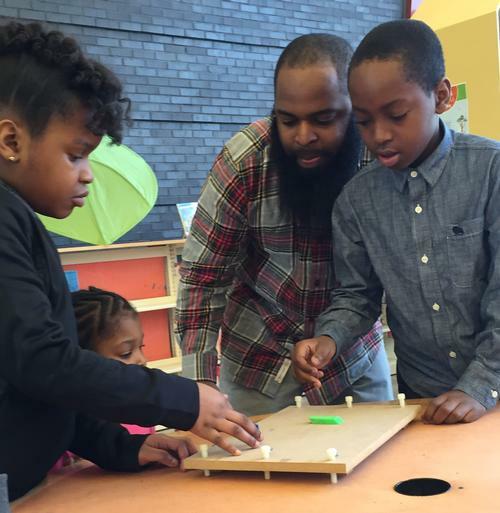 After comparing instrument sounds, families tried out their own sound experiments in a Play Party hosted by the Franklin Institute and the Kimmel Center. A family uses ink to paint a scroll after a lesson from the Philadelphia Zoo and the Philadelphia Museum of Art. Families read ideas about how to compare, using their five senses. Add a Comment to Words at Play Vocabulary Initiative Brings STEAM to the Widener Neighborhood Library!